Another round of NFL picks on the docket. The table has been updated again. By rolling over each game, you'll get the predicted gametime weather. Also, there is a little bit more info when you scroll over each person's icon. And for you subscribers out there, I included a scaled down version of the table in JPEG format...no bells and whistles, but you can at least see the picks and records if your RSS/Atom program can't handle flash. You can find it after the "Continue>>" button if it doesn't automatically appear at the bottom of the post. The guests this week are Accuscore and Accuscore. No, that is not a typo. I was surveying the Harmon Forecast on Sportsline, which I thought was run by a grandpa and his progeny, when I saw at the top of the page that they had been bought out by Accuscore, the world wide leader in generating predictions for all things sports using advanced computer mumbojumbo. Anyway, I remembered ESPN uses Accuscore too (under it's official name) and I thought it was weird because to see the specific score prediction of each game on ESPN you have to be an insider, whereas on Sportsline its all free. So I went to peruse the Accuscore website, just to see if I could get the same info that I could find on Sportsline, thus making ESPN Insider look rather ridiculous. First off, I did find a prediction for every single game, thus making Insider a waste of money in this instance. But then I noticed something; the score for the Steelers-Bills game was 26-14 Steelers on the Accuscore website but in the Harmon Forecast it was 24-15. Thats a mind boggling 3 point difference, which is huge considering the average margin of defeat is only around 3-4 points, and most spreads hover around that range as well. In this case, it switched the pick from Steelers to Bills. Out of the 16 games this weekend, the two Accuscore predictions only matched exactly 1 or 2 times, and the other ones differed enough that the picks against the spread were swapped a whopping 5 times. I'll have the breakdown of the exact score predictions from each site later today or this weekend when I update the table. 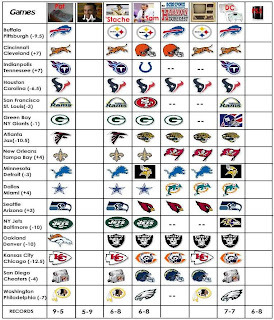 It must be easy to look like computer geniuses when you predict two outcomes for 5 out of the 16 games every week. I've included both on the table to see which one comes out on top. If you can't see the table or do not have flash installed, click continue. I know it's a bit too small...I'm still working on making the resolution better, but did not have enough time to trouble shoot this morning.